Two men were left with serious injuries after a brutal encounter with a group of strangers outside an Andersonville gay bar in September. But they believe the offenders included an off-duty Chicago police sergeant and west suburban officer, and they say the police department’s “code of silence” has shielded those two men from any repercussions. 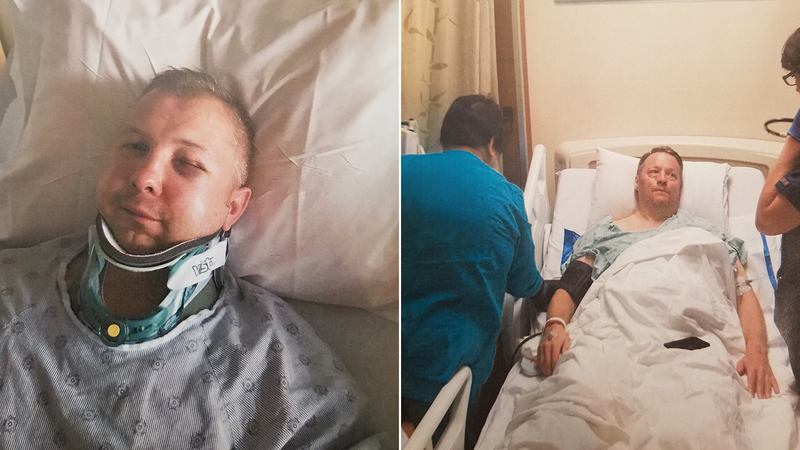 John Sherwood and his partner Tomasz Stacha filed a civil lawsuit last month alleging CPD Sergeant Eric Elkins and Oak Park Officer Dwayne Jones are responsible for a late night beating that left both Sherwood and Stacha with multiple broken bones. Despite being identified more than a month ago as the main assailant on the night of the attack, Elkins has not faced any criminal charges. Elkins is named in the lawsuit along with Jones and two other men who were with the alleged assailants during the attack. A CPD spokesman did not immediately respond to a request for comment Thursday. Jones was placed on paid leave Oct. 18 pending the outcome of an internal investigation, according to a village spokesman. Sherwood, 53, and Stacha, 44, have been partners together for 14 years and currently live in the Edgewater neighborhood. They recalled going to @mosphere, a gay bar in Andersonville, with two other friends that night when another group of heavily intoxicated men entered. That group allegedly included Elkins and Jones. One man from that group fell into Sherwood, who pushed him off, leading to a brief scuffle in which he says he was punched in the face. A bouncer intervened and got the men outside, but Sherwood says only seconds later he was attacked. He claims his leg was kicked and broken while he was still standing. Once he fell, the assailants turned to Stacha, who they allegedly kicked repeatedly as he lay on the ground. He suffered fractures to both cheekbones and damage to his trachea. Sherwood, who says his tibia and fibula were broken during the attack, remains confined to a wheelchair and has missed at least a month of work. Elkins never identified himself as an officer during the encounter. Two men who were with Elkins that night implicated him in the attack to police. This was captured in police dashcam video after one of those men was taken into custody and body camera footage during his interrogation. A day later, a friend of Sherwood and Stacha picked Elkins out of a photo lineup, identifying him as “the drunk guy that was kicking John outside,” according to a police report. The lawsuit identifies Jones as Elkins’ boyfriend. Jones was hired in January by the Oak Park Police Department. He completed the police academy and was sworn in over the summer as an officer under an 18-month probationary period. According to Cavanagh, Elkins has been on desk duty for the last year and has been the subject of at least 35 citizen complaints. He twice faced criminal charges involving alleged sexual encounters with teenage boys and was found not guilty on one charge, but Cavanagh said he pleaded guilty to a lesser charge following an incident in Michigan.